Actually I’ve been watching Kojak a lot recently with my partner, so that heading isn’t quite accurate, but it’s close enough. And any excuse to quote a Galaxie 500 song must be grasped with gusto, after all. So playing Galaxie 500 recently, in part inspired by remembering that line in ‘When Will You Come Home’ which in turn I was reminded of by watching Kojak, and of course then the glorious Naomi Yang was a recent instalment of Mr Carney’s peerless 50,000 Reasons series. As the man is prone to pointing out; it all fits. I remember Kojak from the 1970s. I remember hating it then though I don’t remember why. I recall my mother liking it a great deal though, which I never understood then and understand only fractionally better now. I even struggle to explain my own fascination with the show. It’s not terribly well put together, certainly in the first season, and the pilot (The Marcus Nelson Murders) is over-long and has some embarrassingly clumsy editing. As a police procedural it’s quite shallow and there is no real sense of character development, though it’s fun to see how players switch sides from the pilot to the first season. As for Theo Kojak, well, he’s Kojak and that’s pretty much all you need to know, baby. Though in fact, certainly in those early episodes, he rarely says ‘baby’ and never has the trademark lollipop in his mouth (and in all the episodes I have seen he has never yet come out with the trademark ‘who love’s ya baby’ that echoed around schoolyards the country over). Apparently the lollipops appeared only later as Savalas attempted to give up smoking. It clearly wasn’t working, as he would trade scenes with lollipop and scenes with pencil thin cigar regularly within the same show. So what is it that I find so addictive about the show? Well, at the risk of sounding repetitive, it’s largely to do with the appeal of the New York urban landscape. Or, more specifically, it is to do with the appeal of the disappeared New York urban landscape of the late 1960s and early 1970s. This was of course an era long before Giuliani’s Zero Tolerance erased the graffiti strewn trains, before the ubiquitous gentrification of the city; an era when the city only barely drew itself back from the brink of bankruptcy and into a sparkling new age. So the New York of Kojak is a New York of grime and despondency, of dejection and darkness. It is, like so much of the 1970s, a world besieged by various tones of brown. It’s a mediated lost New York that I’ve grown to love through the ages, courtesy of various other obsessions. So there is Warhol and the Velvets and all those fabulous Nat Finklestein and Billy Name photos; there is Basquait, Downtown 81and by connection all the Ze scenesters; there is the Wild Style movie and the early Hip Hop pioneers; Jonathan Lethem and his Fortress of Solitude and Motherless Brooklyn; Lawrence Block and his gritty Matt Scudder novels (the early instalments of that series in particular being amongst the best ever in the crime genre, or any genre); Danny Lyons' magnificent Destruction of Lower Manhattan or Camilo Jose Vergara's American Ruins. And of course there is Batman’s Gotham, always such a lightly veiled parallel to New York which at its best is always defined in the same dark and gloomy hues, regardless of what shiny new technologies the man in black or his foes might be armed with. 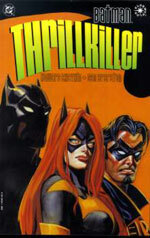 And incidentally, I was re-reading the magnificent Thrillkillertrade paperback recently, and it really is my favourite Batman story, not least for Dan Brereton’s art, but also for the appeal of a Gotham (and thereby America and the World) on the cusp of heady early 1960’s optimism tempered by 1950’s conservatism. That and the fact that Batgirl is the central character and that the hunky Robin gets iced by a fatal snog from a femme fatale Joker. So Theo Kojak as the Batman of the 13th Precinct? Perhaps. Certainly there is the same dedication to justice, the same sense of solitude regardless of partners. And therein almost certainly lies something which helps explain away the appeal that Kojak had to my Mom back in the ‘70s and to myself now. It’s all to do with playing the formula, of setting boundaries and working tightly within those boundaries, of doing the expected with a sincerity and a gritty charm that you can’t help but applaud. It’s about seeing justice done in a world falling apart at the seams, of a character larger than life being capable of looking that world in the eye and saying ‘This ends. Now.’ And whilst it always does, it also carries on regardless, which is also part of the point of course. It’s part of the point of media culture (keep ‘em coming back for more, develop the mythology, perpetuate the brand) and part of the point of core human nature. Of course too, it’s important to have your little obsessions, however fleeting. 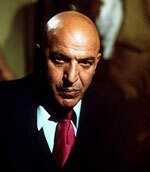 So Kojak joins my list of minor, and not so minor infatuations as hinted at earlier. He fits in comfortably and it’s good to have him on board. It also makes me think that somehow, no matter how hard we might try otherwise, we cannot help but see echoes of our parents’ lives in our own. And sometimes, you know, that’s really not so bad after all.